The Board of Canoeing Ireland wishes to announce the appointment of Karl Dunne as their new Chief Executive Officer. Thanks to all who attended our AGM in December 2015. Minutes and Accounts will be put on our documents page in the coming weeks. Thanks to all who attended our AGM in December 2015. Minutes and Accounts will be posted on our documents page in the coming weeks. Dear paddlers and friends of Irish Canoe Slalom. The selection policy for 2016 is attached. This document will govern the selection of athletes to represent Ireland during the 2016 season. The slalom committee looks forward to seeing you all at the selection events which will take place at Sluice Weir on the 5th and 6th of March and we wish the very best of luck to all the athletes who will compete. We are in the process of Transferring information to our New Website for Canoe Slalom Ireland. Over the next few weeks you will find all slalom information here. Sponsor Junior Hannon’s charity kayak trip. Junior Hannon is kayaking from Lanesborough at the northern end of Lough Ree to Limerick in aid of the Irish Cancer Society, this trip will take approximately 4 days to complete. He has chosen the Irish Cancer Society as the charity that all sponsorship and donations will go to because Cancer has touched everybody’s family either directly, or indirectly. The expedition will start on the 27th May and will be completed by Monday 31st. Click here to sponsor Junior on his journey. Have you seen how many canoeing related nominations feature in this year’s Outsider of the Year awards? Have you voted yet? Best Outdoor Adventure Photo 2015: https://poll.fbapp.io/pgftbo – Liffey Descent by John Shiels. Get voting! Get sharing! Make sure your favourites win! Below are a list of the canoeing related Outsider of the Year nominations from the site. Susan Honan and Sonja Ewen join the ranks on these pages as this summer they became part of an elite group of women who have paddled around Ireland. Paddling between 35km and 65km a day, the 1,600km journey took just over seven weeks and the pair was storm bound for 10 days of that time. Highlights along the way included a 53km non-stop dawn crossing of Donegal Bay. “We got out on the water at about 4am and paddled into the sunlight.” Another standout moment was seeing an orca whale, a minke whale and a massive pod of dolphins leaping out of the water in Kerry. “That was really incredible,” says Susan. Waterford paddler Mick O’Meara turned 50 this year. 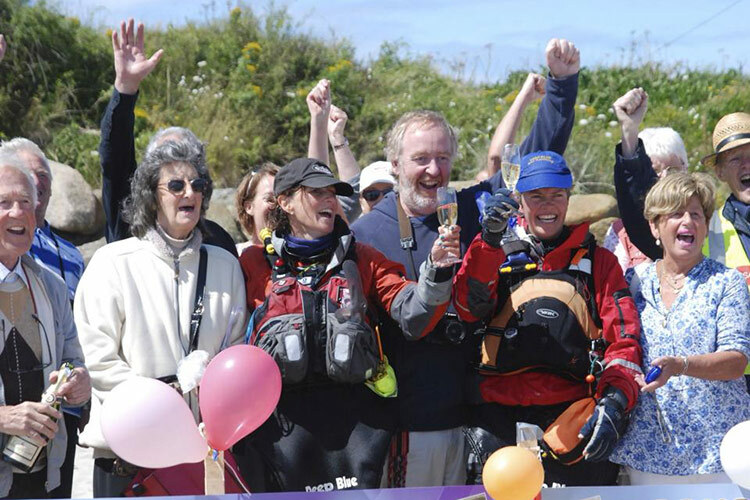 While others might think it’s time to put the feet up, he turned his attention to paddling 930 miles around Ireland – for the second time! And this time he did it solo – and smashed the previous record by a whopping two days – despite miserable and sometimes treacherous weather. But Mick says his main goal wasn’t the record but rather to prove to himself that he could do it solo and to inspire others along the way. No stranger to long journeys, in 1990 Mick made the same trip around Ireland in 33 days. Four years later he circumnavigated Iceland in six weeks. 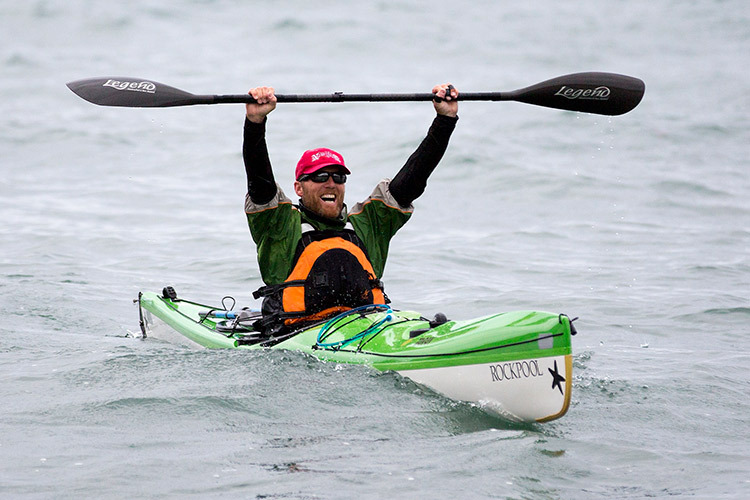 Since then he has won the Devizes to Westminster International Canoe Race three times, the International Liffey Descent seven times, and in 2010 set a record for the fastest crossing of the Irish Sea. On this journey, Mick spent 12 to 14 hours a day alone, and the circumnavigation was achieved without the help of a food and gear support-van following him on land. “In my opinion this is what makes it a true expedition,” says Mick. Crossing the Shannon was one of Mick’s scarier run-ins with the weather. Waves broke in every direction followed by 7m swells, the sea throwing all the power and confusion it could muster at his boat. Mick was reminded of just how vulnerable he was. “This is what you always have to be aware of,” he says. “You’re not bigger than the sea. You’ve always got to expect that the sea is going to crush you. While weather troubles made some days miserable and discouraging, Mick held frequent pep-talks and reality-checks with himself: “I just decided look, you decided to do this, this is your idea, either do it, or go home.” Mick credits this mindset as crucial to his achievement. Mick says the support he received from his wife, Una, and three kids was crucial to his success. 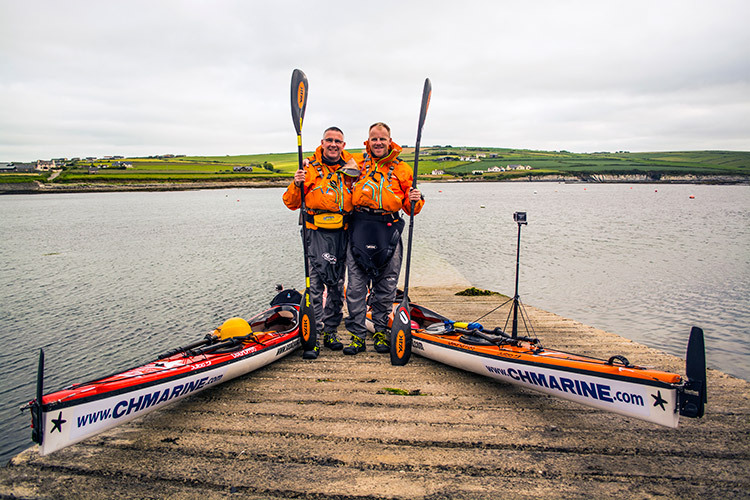 From 16 June to 24 July, kayakers Jon Hynes (Cork) and Sean Cahill (Clare) paddled 1500km+ around Ireland. Their expedition, which was sponsored by CH Marine, involved 34 days kayaking and five days storm bound. When asked about the hardest part of the expedition, Jon states, “Certainly our first week was not quite hell but very challenging. We had 3.5 days of thick fog and had to navigate long open crossings in difficult conditions. Mizen Head was huge, followed by a 28km open crossing into force 4 winds and then straight into a cauldron of raging mess at Dursey Sound with big waves and force 6-7 down-drafting gusts. We were never so glad to hit shore that evening. The pair undertook the circumnavigation as a personal challenge and also to create a resource for anyone else looking to attempt a trip in the future. As they paddled, they raised funds for a disabled hoist for water activities in Cappanalea OETC, Co Kerry. They also made a documentary about their trip and have been it around the island to any club or society that are interested. Despite very challenging weather the pair agree that it was the adventure of a lifetime. “We met so many great people…and experienced wonderful hospitality and generosity,” says Jon. Junior Paddlefest gets a mention and a photo nominated in the Irish Times magazine’s Photo of the year: Life gallery. Excellent photo by Alan Betson. Click on the below link to get the full album.